I am so glad that there are food bloggers, all around the world, who are willing to share their fabulous recipes and expertise. After surfing my way around the blogs, I go to bed dreaming of pastries, cakes and desserts! One site I like to visit is Cannelle Et Vanille, a mouthwatering food blog by a gifted Spanish pastry chef, Aran. I saw her mini peach and pistachio frangipane tarts and, for once, I thought - I could make those - they not only look beautiful, they seem fairly easy too. So here is my version of the tarts. I only murdered your recipe a little Aran, replacing the pistachios in the frangipane with roasted pecans, and I used lemon zest in the Sable Breton. The verdict? 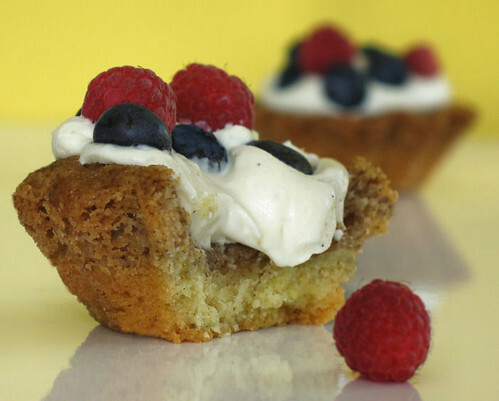 Crisp bottom, soft melting frangipane and absolutely delicious with the mascarpone cream and summer fruits. oh they look fabulous nic! isn't this a great tart with the melting frangipane? great job!! These are so lovely, Nicisme. And I agree, Aran is always inspirational. Frangipane is one of my favourite treats in France, but I've never thought of doing it with pecans rather than almonds. This would be a great addition to my "Southern food with French techniques" collection. Thanks! These are cute, Nic! And Aran does have some amazing recipes there, with stunning photos as well. You DID a great job.....your could have been made by a famous pastry chef!!! BEE-YOO-TI-FUL Nic...absolutely stunning little bites. Aran's blog is certainly very inspirational, with pictures to match. Your crop of raspberries continues to tantalize the tastebuds...mine are currently green with envy!!! The pictures here are very very refreshing! goodness gracious, nic. i'm a crust person, and i have to tell you immediately that the pecan-happy bottom of your tarts is making me swoon. it's gorgeous! frankly, i'm drooling a little. bravo! These are some of the prettiest little things I've seen. Great job! These are gorgeous and just what I've been looking for to go with my latest box of berries. The cream looks delicious and pecans are my favorite. Great pictures Nic, and your tart don't look half bad either! I bet my DH would love this. Tres tres chic :). Love the velvety look of those blue berries in the first photo. Aran - thank you and thanks for the recipe! Susan - thanks and I agree too! Judith - do try them, they're yummy! Patricia - thank you, and what are you doing posting? You should be busy with the move! Good luck by the way! Nina - thank you so much! Deeba - THAAAANK YOOOO! Sorry that you haven't got any raspberries when they are so yummy! LyB - I expect these would be good with any roasted nuts! Grace - the pecans are in the top bit of the crust, and are definitely swoon worthy! Lisa - give them a go, you won't be sorry! Nic as always your pictures are fantastic! I don't even like desserts but seeing yours could convert me! PS: You've been given an Award - pop over to my blog to get it! I love the combination of pistachio and fresh summer berries. From the looks of the pictures, you executed this dessert perfectly. I think after seeing it, I might just have to indulge and make it. You did an amazing job on both the tarts and the photos! I love frangipane - the pecan is a fabulous touch. Nic, those little sweeties look wonderfully tasty and pretty! Wonderful frangipane tarts - they look delicious. I don't see any murder there :) They look fantastic! Nic, you have been tagged. Drop by my blog to see the rules. Great job Nic - Aran always has such beautiful things on her blog and I'm generally too intimidated and think I'll just screw it up. Nic, you know how to tempt, tease and taunt us. Excellent job! I just bought little tartlette pans, thinking that I may actually be courageous enough to try them out. yumm those look so cute and delicious! Yum Yum things in ur blog. I like this tarts and salad also. First time here. Nice blog. I voted for this on Foodie View because they just look so yummy! 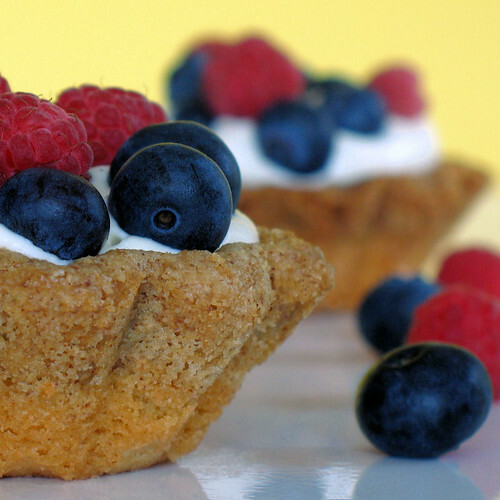 Your little tarts look absolutely mouthwatering! I love everything about them, including the stunning photos! Excellent work! Wow those do look good! That melty photo really got my mouth watering. You didn't murder the recipe...they look so beautiful and tasty! Great job! Waiter, there's something in my..... bagel chips!